Alongside ASUS Zenfone 3 Deluxe and the ASUS Zenfone 3 that we talked about, there’s another one smartphone within the Zenfone 3 family being introduced, the ASUS Zenfone 3 Ultra. With the name being said Ultra ( similar to Xperia Z Ultra ) we can expect the screen to be bigger and of course the Zenfone 3 Ultra comes with a 6.8-inch Full HD display. The ASUS Zenfone 3 Ultra uses the Snapdragon 652 processor. There’s 4GB of RAM and the internal storage comes at 64GB. The battery capacity comes at 4600mAh and supports QuickCharge 3.0 which is based on USB Type C port. The camera is the same one on the Zenfone 3 Deluxe which is the 23MP shooter while the front is a 8MP shooter. Other features such as reverse charge, Dual speaker, finger print scanner on the front is present on the ASUS Zenfone 3 Ultra. 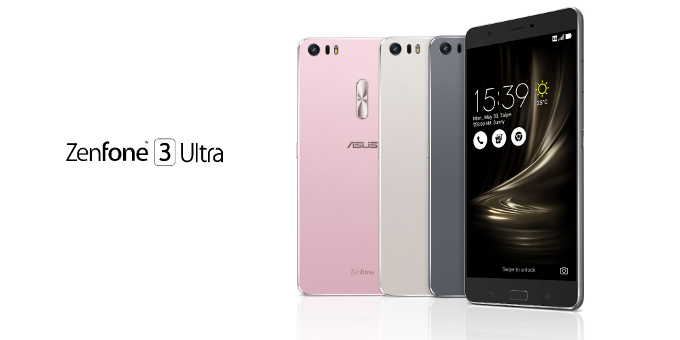 This smarpthone from ASUS is priced from US $479.